I started my Illustrator 201 class today….and this first lesson we were working with Gradient Meshes. Here is the apple jpeg that we had in class. This is a picture of an apple. 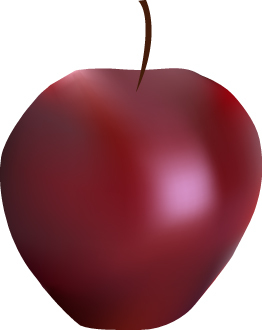 Here is my Illustrator apple. Made with the gradient mesh. It’s still a work in progress…but I wanted to post something for today and it’s almost time for work….so here you go!! Sorry the apple jpeg is so small. This entry was posted on Thursday, January 27th, 2011 at 3:14 pm and is filed under Uncategorized. You can follow any responses to this entry through the RSS 2.0 feed. You can leave a response, or trackback from your own site. Great job on the apple!